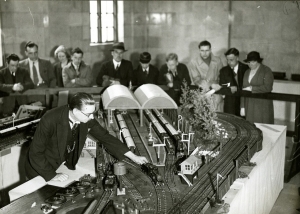 The Manchester Model Railway Society was formed at a public meeting on March 24, 1925 at The Clarion Café in Market Street. At first, the Society staged half-yearly exhibitions of members’ work at their regular meetings, and it was not until 14th November 1931 that the first public exhibition was staged. This was a one day event at a Sunday school in the centre of Manchester with an admission charge of 3d (1¼p). The event was successful, and by 1933 it had evolved into a three day exhibition at the Albert Hall (just opposite Manchester’s Free Trade Hall) where it continued until 1938. Click for a Pathe newsreel clip of our 1937 show. There were no public exhibitions during WWII, though meetings and displays of members’ work continued throughoput the war. The first post-war public exhibition staged by the Society was a three day event in December 1947 attended by over 7000 visitors, although it did supply exhibits for other shows from July 1945 onwards. Our annual exhibition has been staged at various venues, notably the Corn Exchange, UMIST, New Century Hall and the Armitage Centre. Our 90th birthday year, 2015, was marked by the 78th public exhibition organised by the Society and a triumphant return to the city centre – the only Model Railway Exhibition to be held in the centre of a major UK city. We have also appeared at many other exhibitions, for example the Northern Modelling Exhibition at EventCity, near the Trafford Centre, on 2nd and 3rd March 2012, where three members’ layouts were on display.